Gongs have a long history in the art of healing and meditation, but it is difficult to say when gongs first came into use. It is thought that around 6,000 years ago when people first cooked with wheat for large groups of people, crude ovens came into use. The ovens got larger and hotter over the course of time and with experience. Molten metals released at various temperatures would form together at the base of the oven, thus forming bronze and the discovery of a new metal. This was happening in many places and it is thought that the spread of this alchemy was rapid. Experience tells us today that when people hear the gong and are immersed in the multi-vibrational effects, life-changing events may occur. 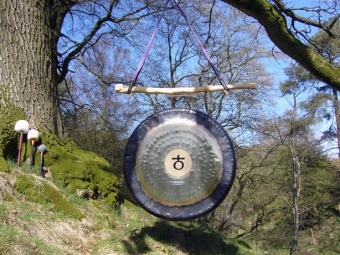 Toxins may be released from the body after being immersed in the power of the gong's vibration and so it is recommended to drink lots of water after a gong healing to flush out any residues. After a gong bath, emotional issues may surface, the energies available now to be let go of, or visited with a new light.